Building a Foundation- I'm giving my kids the love I never had. Building a Foundation- I’m giving my kids the love I never had. 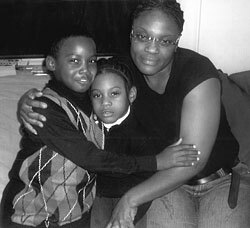 When I was a little girl, my siblings and I went from group homes to foster homes, from one grandmother’s house to the other grandmother’s house, due to our parents’ drug use. Some people might think that, growing up in the foster care system for half my life, I wouldn’t let my children go through the same experiences. Not so. I have five children and—I’m not proud to say this—all five children eventually wound up in foster care too. Having five children in the system is very depressing for me. But I’m in a treatment program and I feel confident that I will reunify with my two youngest children very soon. I am determined to succeed. I want to break the cycle. I will not die from drugs like my mother did. I will build the foundation that was missing in my childhood and help my children grow up feeling cared about and loved. Moving from home to home as a child, I felt that no one cared about me, especially my mother and father. I felt unwanted, and this made me feel like no one could like me. I remember being in gym class in the 8th grade. Every day, I sat in that same corner. The other girls would go to the locker room and get dressed but not me. I wouldn’t play. The gym teacher did nothing to break me out of that corner. As I am writing this story, remembering those times, I am feeling a little lonely. As a teenager, I started staying out until 2 a.m., smoking marijuana and sleeping with boys. Sleeping around made me feel wanted. My grandmother called me a ho. She would always say, “You’re going to be just like your mother.” One day my grandmother hit me with a two-by-four and I hit her back with my hand. That is when she called the agency to take me once again to a group home. My grandmother rode with me up to a group home where I stayed for four years. As we rode down the highway, my grandmother told me, “I’m sending you upstate for your own good.” I felt so alone and unwanted. In the group home, I started drinking and smoking weed more often. When I was high my loneliness and depression went away for a moment. Looking for love also wound me up in violent situations with men, and the violence sent me further into my drug addiction. At 16, I left the group home to live with an older man who I wound up marrying. At first I was holding down a 9 to 5 and also going to the clubs and getting drunk on the weekends. But as time went on, our drinking led us to lose our jobs. My husband started stealing, got caught, and the judge slapped him with a long sentence. I thought I would die. I was so scared. All I knew was this man. Soon I started hanging out with a negative crowd and, when I was 19, I was introduced to crack. I didn’t know the impact it would have on me. I got pregnant with my first son when I was 23, after I met a big drug dealer who supplied me with crack. I had my son because I was lonely. But he was born positive tox and was taken from me from me right from the hospital. Eventually he got lost in the system. To this day all I know is that he is 21 years old. Five years later I had a son and a daughter who were also taken at birth and were adopted by their aunt. They are now 17 and 13. At that time, their father used to beat me for breakfast, lunch and dinner. He took my money, my dignity and respect. I just kept on drugging. Drug use completely took over my life. I almost died from drugs and yet continued to use. Using landed me in prison for three years. There I kept asking myself, “What is wrong with me that I can’t stop using drugs? Why am I in these abusive relationships, thinking about a man before myself or my children?” I also thought about how my family didn’t care for me. Those thoughts put me into a deeper and deeper depression. After I left prison, I went from one program to the next. I kept trying to get clean because I’m a very determined person. But the negative people had too big a grip on me, and I kept them in my life. Finally when I was 37, I went into a shelter when I was pregnant and I got clean. I had my youngest son, and two years later, I gave birth to my youngest daughter. My last two children I took home with me from the hospital. I was proud of myself. I relapsed once, when my son was four months old, and I found out his father was cheating on me. But I straightened out, and after that, I worked hard to be a good mother and to stay clean. I went to an outpatient program, I got a two-bedroom apartment, and I went to an employment program and landed a job with the Board of Education. After four months, I was promoted to a private secretary. I was climbing the ladder fast. I even started to go to school to get my GED. I also decided that trying to find the right man was too much drama. I felt good being a single mother to my children. Every Saturday we went to Jamaica Avenue and shopped. I treated the kids to McDonald’s and I ate pizza. At home, they liked to jump on my bed and bother each other. After school, they loved to watch Madagascar. I still love to watch Madagascar because it reminds me of being home with my children. I’d cook dinner while they watched, then I’d iron their clothes and go to bed. It was just us three having fun. But after four years of being a good mom, I returned to using drugs. I was working far from where I lived, and my school was far away in the other direction. I began feeling depressed and stressed out being a single parent of a 2 and 3 year old. That last straw was that the program that was helping me pay my bills ended, so I had to pay $1200 a month for rent on my own. Soon I was backed up on my rent. I started hanging out with old friends and drinking every weekend. Then I lost my home, and I started drinking even more. Then I turned back to drugs. Eventually, I lost my children. For a while after I lost them, I gave up on life. I was out on the streets. Finally, though, I went to a women’s shelter and told the social worker there that I wanted to get clean but couldn’t. They sent me to an out patient rehab program, but I still couldn’t stay clean. I set myself back so many times. Finally, I came to a residential program, VIP Women’s Services, on Sept. 2, 2007. I relapsed for one month on New Year’s Eve after I went to see my son and daughter and grew depressed. But I returned to the program, and since February 25, 2008, I have been clean. This is the best program I have ever attended. In therapy I realized that since I had no solid emotional foundation in my life, and no secure feeling of being loved or of belonging, whenever things became hard, I became depressed and turned to drugs. I also started to see a psychiatrist. I had always said, “I don’t need pills.” But I knew I was falling into depression again and would relapse. So he put me on an anti-depressant medication. Soon I could feel a difference. Now, when I get stressed about my children, I am better able to stay focused on getting my life back together and child welfare out of our lives. I am also taking anger management and parenting skills classes, and doing an internship at a nursing home as an administrative assistant. Plus I am studying for my GED. Every time I take it I fail the math but I’ve been studying math for seven months now and feel like I am ready to pass the test this time. I know I made bad mistakes but I am a good person. I will not forget about keeping the faith with God, who continued to carry me the whole time. I don’t think just about myself anymore. Now I think about my children, my family, the people that suffer when I relapse. I know I cannot wallow in self-pity anymore. I am too old for that. I am confident that I will make it. I feel sad that all my children are separated. They do not even know one another. But I am searching for my 21 year old, and I will speak to my middle children soon. I hope to explain to them the trials and tribulations that I and their grandparents have been through. I do not want them to turn out like me and my parents: addicts. I want them to grow up to love themselves and their children. I am close to reunifying with my youngest children. I face a lot of challenges as a parent. The biggest challenge I face is with myself. Still, I go to visit my youngest children every week, and I have overnights with my son. They are so happy to see me. On overnights, my son and I, go to movies and out to eat. We play videogames and I take him to the park. We stay at my aunt’s house or spend time with my brother. We talk. My son talks like he’s 20 years old. Once he told me, “You’re the best Mommy in the world because you give me hugs, kisses and gifts.” That’s what keeps me motivated—knowing my kids love me and depend on me.